Wendell Kimbrough’ Hymns & Friends is available for preorder or immediate download at Bandcamp. This project is a celebration of songs that transcend generations. I learned many of them while growing up in a small church in the rural South, where the congregation was comprised mostly of dear brothers and sisters in the later stages of life. The creation of these recordings, however, grew out of the years I spent leading music at an Anglican church plant in urban Washington, DC. I have heard 20-something young professionals and retired grandparents sing these songs with equal love and enthusiasm. The hymns on this album also transcend musical styles. Their basic components—text, melody, and harmony—are so well built that they can be led by choirs and pipe organs or by guitars, bass, and drums. When sung in the Spirit’s power, they can shake the walls of cathedrals or bring a living room full of people to a foot-stomping crescendo. Added to this collection of great hymns, you will find two songs I co-wrote with my friend Bruce Benedict. Think of these as understudies—humble little songs that are shadowing and striving to learn from some of the best congregational pieces ever written. You can see the track listing and hear the music in this player. Categories: Music, Recommendations | Permalink. Lent To Maundy Thursday is Page CXVI’s second seasonal EP being produced as a result of a successful indiegogo campaign. Seven tracks: some classics, some retuned and some original. Thematically taking us from wilderness to the cross. It demands all year listening. Available at their site or iTunes. And here’s the sound cloud embed. 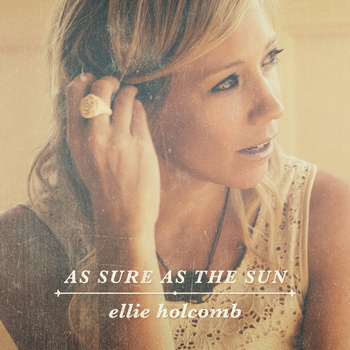 I was a kickstarter backer of Ellie Holcomb’s As Sure As The Sun. The album is an eleven track collection of songs which reflect a variety of Scriptural themes. Although it’s Ellie’s first full length solo album, all the experience of her past EPs and work with Drew Holcomb and the Neighbors is demonstrated on an assured and varied recording. You can purchase it from a variety of online retailers, but I always recommend bandcamp. To mark the impending release of a new EP Zac Hicks has made his two prior albums, Without Our Aid and The Glad Song available free for download from Noisetrade for the next two weeks. At mgpc we use Sola in worship. Various resource elements are available at Zac’s blog. So, head over to Noisetrade and grab both albums for free, or leave a tip. If they’re not your cup of tea, you probably know someone you can recommend them to. Categories: Free Stuff, Music, Recommendations | Permalink. Go and download Christa Wells’ Feed Your Soul which is now available free at Noisetrade. It is a beautiful collection of thoughtful and affecting lyrics delivered with deft vocals in a piano-driven indie-pop style. I can listen to it over and over, and have been since purchasing my copy last year. I don’t know whether this is permanent or for a limited time, so get in quick. And if, by chance you do miss out, the download at bandcamp is a bargain price. You can listen on this player, which can take you to the album page at bandcamp, but if you want to visit Noisetrade for the free version, click the Noisetrade links above. The album releases on April 1, but if you preorder at Bandcamp now you get two tracks straight away. Having read the Gilles’ blog over the last couple of years I’m sure the album will be a very authentic and very faith encouraging set of songs. Have a listen to the two pre-release tracks. Hiding Place is Matthew Smith’s follow-up to his fourth album Watch The Rising Day. I posted about Watch The Rising Day back in 2010. Hiding Place is now available for preorder at Matthew’s bandcamp store, with the added bonus of two tracks available now and a download code for his first album Even When My Heart Is Breaking. Old hymn lyrics set to new folk-rock tunes. Have a listen to these two.